← An Initial Exploration of Printz Award Winners from Outside the U.S. Welcome to the second issue of the Journal of Research on Libraries and Young Adults (JRLYA), the official research journal of the YALSA and the only research journal devoted to youth librarianship. The intent of this journal is to enhance the development of theory, research, and practices to support young adult library services in information-rich environments. For librarians, these relationships are deeply intertwined and help us model the inquisitiveness, creativity, and lifelong learning we hope to impart to our younger patrons. As librarians, we strive to understand the information needs of our users and how to help our patrons use information to meet their person needs. 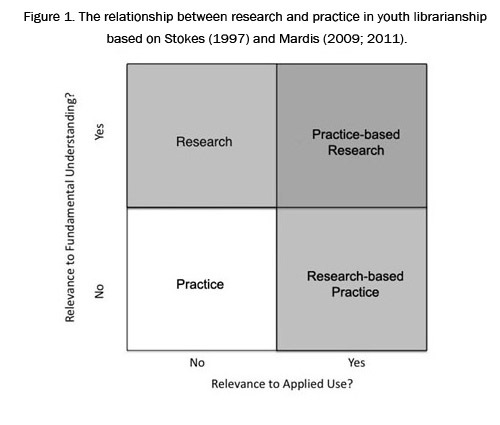 Practice without research and research without practice are close-ended endeavors that lack the responsiveness to patrons which is central to youth librarianship. Joni Bodart and her research team have examined the role of the Printz Award in youth literature. In this study, the researchers discovered consistent themes in Printz Award-winning books that not only help youth make sense of the world around them, but the Award also raises some larger questions about youth librarianship and how books are selected for recognition. In the final paper from the YALSA’s 2010 Symposium (other papers from this event were included in the Fall 2010 issue of JRLYA), Catherine Andronik shares a thought piece in which she frames her intended research also regarding the Printz Award winners. She compares the Printz Award winners and award process to the ways in which literature for young adults is treated differently in Australia. We are looking forward to your continued exploration of this area, Catherine! Amy Pelman and Beverly’ Lynch present a thorough and detailed analysis of the laws pertaining to intellectual freedom in libraries. Through an examination of laws and court cases, they trace the development of the guidelines and values librarians embody to ensure that libraries remain places where information and thought are freely developed and exchanged. Regardless of whether you consider yourself a practice-based researcher or a research-based practictioner, JRLYA offers you scholarly, but accessible, investigations of phenomena that make librarianship an exciting, ever-changing, rigorous field. Even if you never considered the role of research in your own practice, enjoy these articles and you will be inspired to ask, explore, and answer your own questions! Mardis, M. A. (2009). A gentle manifesto on the’ relevance and obscurity of school libraries in LIS research.’ Library Trends, 58(1), 1-8. Mardis, M. A. (2011). Evidence or evidence-based’ practice? An analysis of IASL Research Forum papers 1998-2009.’ Evidence Based Library and Information’ Practice‘ (EBLIP), 6(31), pp. 4-23. Stokes, D. E. (1997).’ Pasteur’s quadrant: Basic science and technological innovation.’ Washington, D.C.: Brookings Institution Press. This entry was posted in Editorial, Volume 1 Number 2: February 2011 and tagged From the Editor. Bookmark the permalink.